‘She’s a beauty” the 48-215 Holden or more commonly the FX. While most of the world, including Australia, has this year celebrated the Golden Jubilee of motoring landmarks such as the first Porsche car, the birth of the Land Rover and Jaguar XK series engine, down under it was an Aussie icon that stole the show. November 29th, 1998 saw Holden Australia celebrate 50 years of car manufacturer, with special events being held across the country. The company was founded in 1856 by James Alexander Holden, who migrated from Staffordshire in England and set up a saddlery business in Adelaide. His son Henry became a partner in 1883 and in 1887 the company merged with Adolf Frost, a carriage builder. In 1917 Holden and Frost Ltd. was approached to build bodies for imported Dodge chassis’ due to the Australian Governments import embargo legislation on complete cars. In 1923 General Motors announced that they would use Holden as a sole body supplier, eventually purchasing Holden Motor Body Builders at Woodville in South Australia in 1931. But it was towards the end of the second world war that the Australian Government decided it was time for an entirely Australian built car, and General Motors Holden was considered best positioned to build it. GM-H rose to the challenge, being fortunate that an existing Chevrolet design almost fit the bill before it was re-engineered to suit local conditions and restyled by GM-H designers to suit Australian tastes. Holden 50th Celebration Fishermen’s Wharf Port Adelaide. 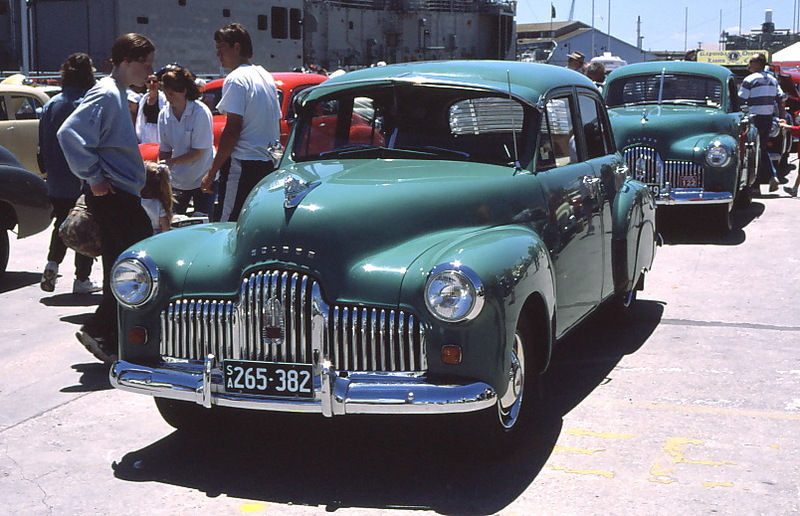 With a loan of 3 million pounds from the Commonwealth Bank and the Bank of South Australia, GM-H started to tool up it’s Fishermen’s Bend (Victoria), and Woodville (South Australia) plants for production of the six-cylinder 48-215 model Holden that would commonly be known as the FX. The first 48-215 rolled of the productions lines at Fishermen’s Bend on November the 29th 1948 and was greeted by the words, “She’s a beauty!” from the then Prime Minister, Ben Chifley. The locally made car went on to top the sales charts and receive the enormous public acceptance that made it an Aussie icon. The celebration of GM-H’s achievements was headed by a re-enactment of the first 48-215 rolling off the assembly line in the presence of Australia’s current Prime Minister, John Howard. The ceremony was aptly held in the Fishermen’s Bend plants Social Hall and was attended by some of the original engineers who worked on the project. Holden’s on display at Elizabeth Oval. 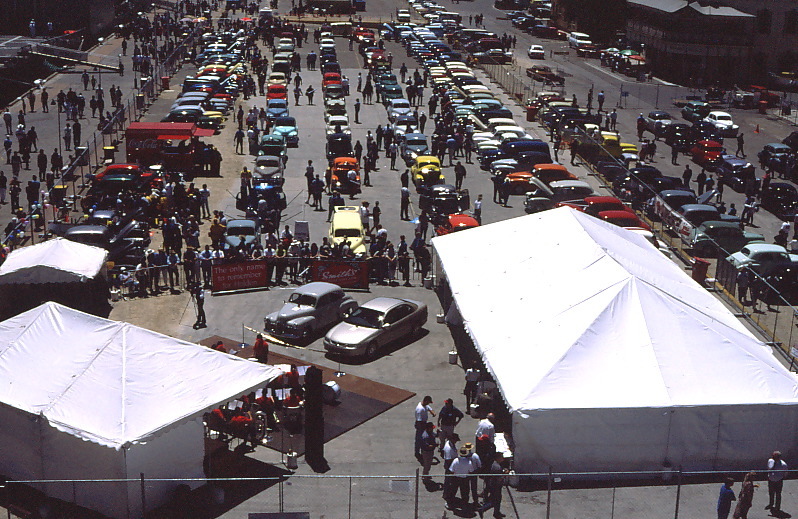 In South Australia, there was a display of over one hundred different model FX, and FJ Holden’s on Fisherman’s Wharf at Port Adelaide, not far from the now disused Woodville plant. While at the Elizabeth plant, which is now Holden’s single vehicle manufacturing plant in Australia, there were guided tours for the public to see how Australia’s number one selling family car, the VT Commodore is made. 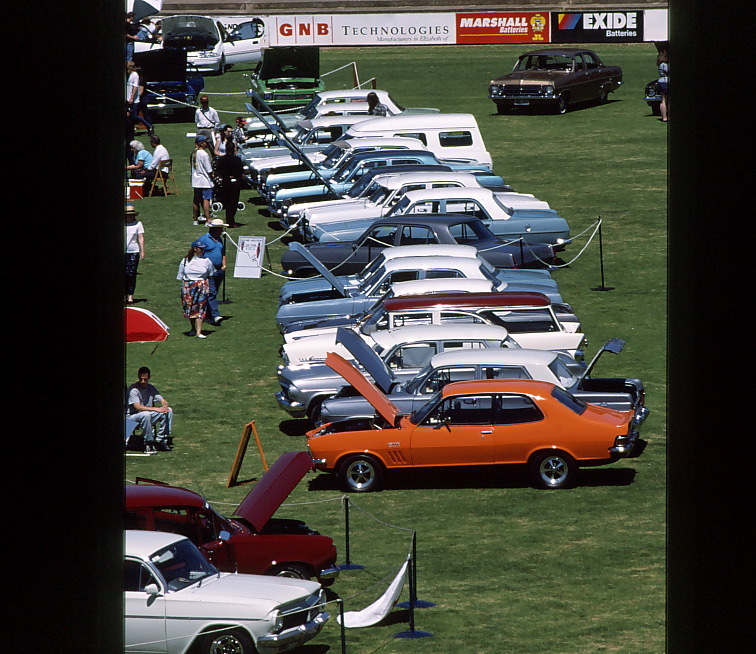 At Elizabeth Oval, there was an all Holden day with a wide variety of models on display, with many similar events being held around the country. Words and photographs Geoff Dawes. (C) 1998. Published in Classic and Sports Car (UK) 1998. This entry was posted in Motoring and tagged 48-215 Holden, Australia, Commonwealth Bank, Elizabeth Oval, General Motors, Holden, Jaguar XK, South Australia on 19/08/2013 by Geoff Dawes.